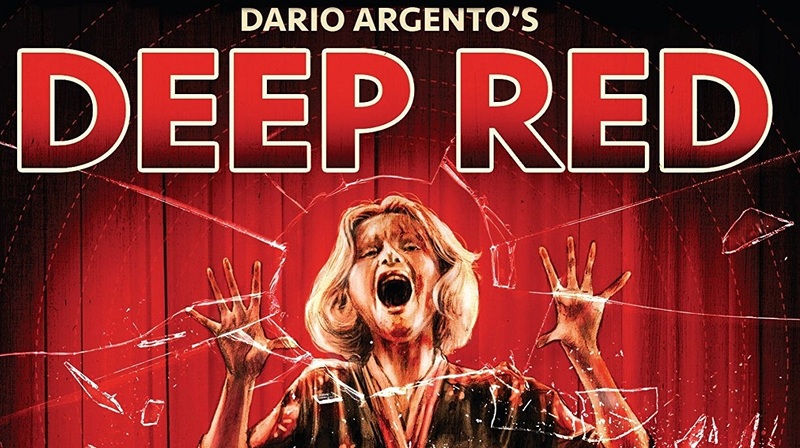 Adam takes his talents as a Piano playing amateur Sleuth to solve the mystery of the murdered Psychic in Arrow Video’s new Blu-Ray Release of Dario Argento’s classic Deep Red. Arrow has pulled out all the stops for the Giallo classic starring David Hemmings, and Daria Nicolodi. Dario Argento’s early career rise to director feels like one of the best career ascents since Billy Wilder. In the late 1960’s Argento is a screenwriter for both Sergio Leone, and Umberto Lenzi. One can imagine the lessons learned from two completely different masterful directors. After a string of successful Westerns and War films, Argento goes onto direct one of the most audacious debuts in horror cinema with The Bird with the Crystal Plumage in 1970. On the heels of that uber-successful film back directs back-to-back films in 1971; The Cat O’ Nine Tails and Four Flies on Velvet. It would be three years and a failed historical epic (The Five Days) that would bring him back to his Giallo roots, with great success in Deep Red. David Hemmings plays Marcus Daly a pianist living in Italy, whose life is upended when he partially witnesses the murder of a psychic. This leads Marcus down a rabbit hole of murders, deceit and a game of cat and mouse with a killer who is more the cat that Marcus realizes. Marcus is aided by Gianna Brezzi (Daria Nicolodi) a reporter who seems to be fascinated, repulsed, amused, and charmed by the musician, oftentimes all at once. Their investigation pushes the killer further and further towards the final third act conflict. Anyone that has seen a few 1970’s era Giallo will instantly note the structural similarities almost immediately as they have been done to death and border on parody. What Deep Red lacks in narrative originality and boldness more than makes up for in stylish direction, design, and execution. Argento has created an angry film with conflicting almost contradictory viewpoints. Deep Red seems to want to focus on counterpoints; progressive vs. conservatism, feminism vs. masculinity, homosexuality vs. homophobia. All play out in the film in a very modern way. Argento shows the unfiltered bigotry of characters in stark contrast to the progressive forward thinking ones. These counterpoints play out in the background never really becoming plot points rather it adding to the ambiance of the piece. As directed by Argento the film is an amazing piece of horror mystery as there has been. The director’s camera constantly roving as the killer. Macro photography that details the killer’s charms and keepsakes. Much of the direction is similar to Jonathan Demme’s work with the subjective camera. Much like Demme’s filmography, the work here still feels fresh almost forty-five years later. There is a sense of playful confidence to the work, a master knowing how an audience will react and subverting that. There is an ornateness to the set pieces that recalls Hitchcock but never feels like he’s aping the master’s style. In all Argento’s work, especially, Deep Red, he feels like he’s digested cinema and style and he’s truly processed it, to come up with his own style. Deep Red is the filmmaker at the top of his game before the dream logic took over his work. The story is still grounded in a world with normal conventions of the Giallo Film. To put a blunt point on the matter Deep Red is, in fact, the best “Giallo Film” ever produced. Its strict adherence to the rules and form of the genre bring something out in Argento’s direction and writing. There is a focus to Deep Red that isn’t present in his later work. The film is layered with subtext and supertext in a way that still works today. The direction is uniformly terrific, with as much style and thought given to even the smaller scenes that separates it from its peers. It is fitting that this earmarks the end of a moment in Argento’s career. He would return to Giallos of course. A year later in fact. But Suspiria is a new form of Giallo, with the adding of the supernatural element that is only hinted and flirted with in Deep Red. Much of his later work (Post-Suspiria) within Giallo becomes an outright nightmare, hindering on dream logic and the supernatural more than reality. Deep Red is one of the high water marks of Dario Argento’s career and by default the Giallo genre itself. Story, performance, direction, and theme all collude to create a potent cinematic experience. If one has not seen Deep Red, you have missed out on not one of the great Giallo’s but one of the truly magnificent films ever produced. The brand new 2K restoration of the film from the original camera negative is nothing short of stunning. Arrow continues to push great transfers out into the world. The sharp transfer beautifully renders the deep blacks of the image. This along with The Cat O’ Nine Tails and Suspiria Blu-Ray discs are simply stunning. Arrow has smartly included all the previous features included on their UK-Only edition of the film and a few extra pieces. They have one-upped the UK-Only edition by including both the US otherwise known as the Export Version and the European Version. The European cut is definitely the way to go as the Export version cuts about twenty minutes of footage from the film. One word of note, the original version can be played in Italian with English Subtitles or English BUT… intercut with Italian dialog. Arrow is upfront about this when you select the Extended version they do give a lengthy explanation. It makes for a fascinating watch with the English/Italian audio mix as it is a clear indicator of what they specifically cut out. Profondo Giallo is a 30-minute visual essay by critic Michael Mackenzie that takes an In-Depth look at Deep Red, its influences and its place in Giallo history. Rosso Recollections is a 20-minute interview with Dario Argento. The director is still critical of his work here but it is nowhere near his criticisms of The Cat O’ Nine Tails. Here Argento seems to have a genuine affection for his work (which good reason, it’s masterful), breaking down how the project came to be, and his history and future with it (he wanted to do a 3D remake which was cast aside once his terrible Dracula 3D was released). The Lady in Red is a 25-minute interview with Daria Nicolodi about her role in the film, her career and time with Dario Argento. It’s a great interview filled with interesting tidbits about the making of Deep Red and the personal drama that led Argento to make the film. Her comments about Argento’s remake plans are especially fun and pointed. Music to Murder For! is a 15-minute interview with Goblin’s Claudio Simonetti. The Keyboardist for the seminal Italian Prog Rock Band discusses how they became involved with Deep Red, their history with Argento, and their recent reunion tour. What are you waiting for… BUY DEEP RED! Buy it now. The film, extras, transfer, everything about this package says it is an insta-purchase. Highest possible recommendations! Arrow Video’s Blu-Ray of Deep Red is being released on April 10th.